Cookies created with a triple amount of chocolate within. 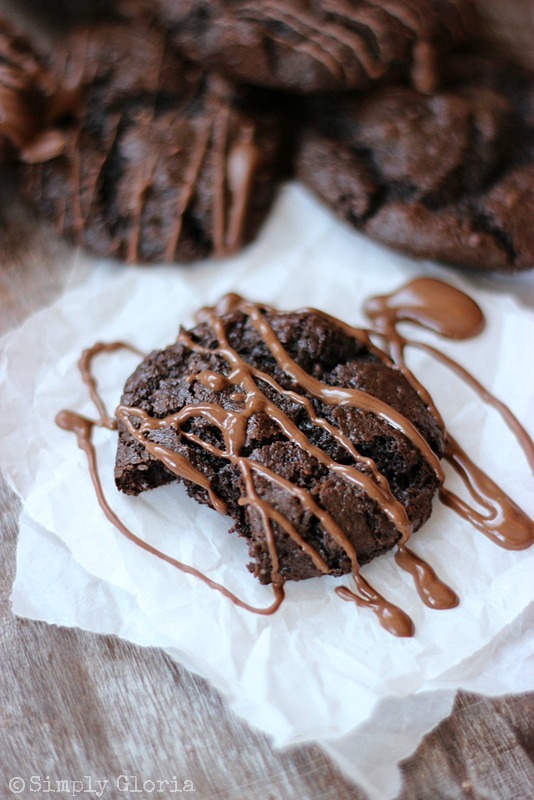 The applesauce makes these chocolaty cookies amazingly moist and chewy! The best way in which I can describe these cookies, they are not like your regular chocolate cookie. These are so very moist, and yet chewy. I guess, like taking a bite out of a really good brownie. These cookies pretty much melt right in your mouth! There are a few ways how I got these Triple Chocolate Applesauce Cookies to where they are very moist, soft, and chewy… and chocolaty! When I was creating these cookies, I used cake flour– instead of the regular all-purpose flour. The reason being, I wanted a tender and delicate texture in the cookie. Cake flour has a fine texture and high starch content compared to all-purpose flour. Don’t be fooled… it’s not just for cakes! I added more unsweetened baking cocoa powder to the flour than you normally would think to add. Because, baking cocoa powder is like flour– a powder. I wanted these cookies chocolaty! But, not taste like it was full of flour. To get these cookies more on the even more chocolaty side, I added melted chocolate to the batter. There’s also chocolate chips inside, as well! Which is how it is Triple Chocolate. Applesauce gives these cookies the moistness needed with all the chocolate. If you have never cooked with applesauce before, be assured you do not taste it in the cookie at all. The applesauce is mainly in there for the texture content. Drizzle some melted chocolate on the tops of each cookie. This part is totally optional. But it’s fun and gives the cookies a little bit more personality, don’t you think? Let’s just chocolate these right up! Baking cookies are one of my most very favorite things to do in the kitchen. What is your most favorite thing to do or make in the kitchen? 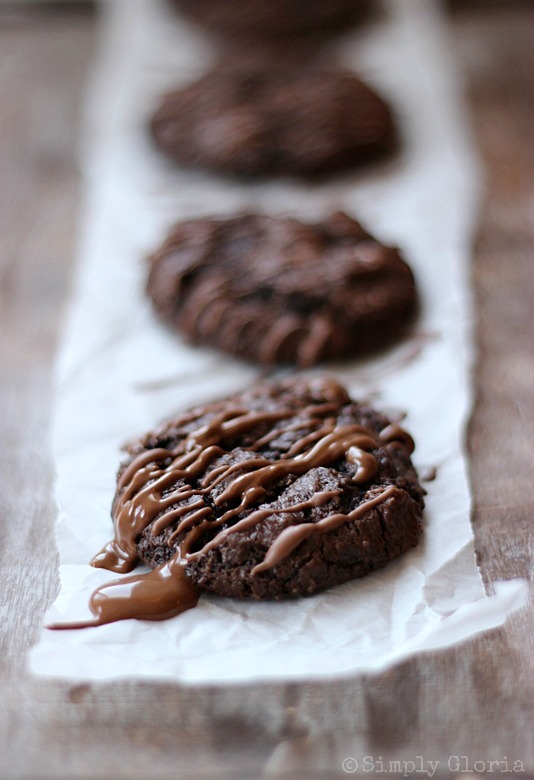 Cookies created with a triple amount of chocolate within. 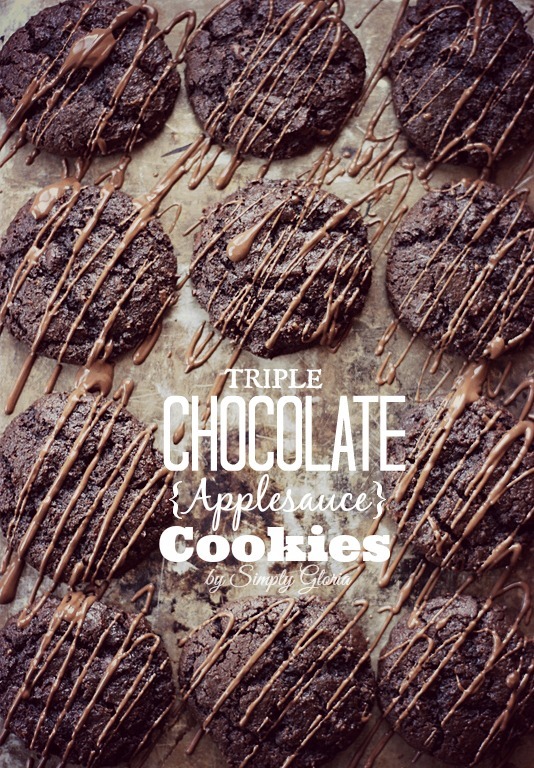 Applesauce is what makes these chocolaty cookies amazingly moist and chewy! Makes about 3 medium size dozen cookies. Mix in the egg and yolk. Add the vanilla, applesauce, and 4 ounces of melted chocolate. In a separate bowl, sift the cake flour. Add in the baking cocoa, salt, baking powder, and baking soda. Whisk all of the dry ingredients together. Slowly add the flour into the mixing bowl of wet ingredients. Do not over mix. Refrigerate cookie batter for 15-30 minutes. Allow the cookies to cool on the baking sheet for 5-7 minutes. They will finish setting up to put onto a cooling rack. Store in an air tight container and cookies will stay soft up to 4 days. One bite of these chocolaty cookies ….and you’ll be in chocolate bliss! These cookies look heavenly Gloria! All that chocolate and so moist too – YUM! Pinned! In fact, I just bought some applesauce this morning, so I can make them!! Oh my….these look awesome, Gloria! I love baking with applesauce–it really does help cookies stay moist! Oh YES Gloria!! I am ready for more chocolate in my life! These look scrumptious!! What a clever little idea to put applesauce in them to keep them moist. Love it!! A girl has to have her chocolate! Thanks, Renee! 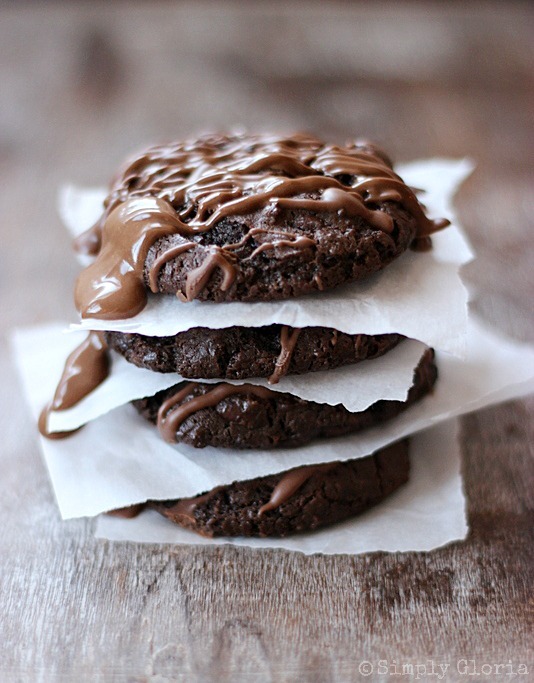 I cannot wrap my mind around how there is applesauce in these sublimely gorgeous chocolate cookies! Must try, Gloria! sally @ sallys baking addiction recently posted…Favorite Homemade Hummus with Spiced Pita Chips. Have a most fabulous Friday, Sally! I am definitely going to make these, Gloria. The pics are making me wish I had a few in front of me right now! Hi Gloria, I have read the recipe twice and I don’t see where the cup of chocolate chips go in. Did I miss it some where? Just updated the recipe, thank you! Wow! I dub thee the cookie queen! Always amaze me! You are so creative with your pictures and I always feel like I can taste then when looking at it! Pinning this, and I love that you made them with applesauce! I’ve heard of so many cookies/cakes using applesauce, but I’ve never tried it. I think these cookies are the excuse to finally try it. They look sinfully delish! Mmmmmmmm. Sounds delicious. Definitely going on the menu for next week! Gloria, this is a great recipe! I love that you used cake flour and the addition of applesauce is a genius idea! I love soft cookies the best – and triple chocolate, oh yes! 🙂 Thanks for sharing and of course, pinning! Happy Thursday! Yay, for the *soft cookie team*! Thanks, Cindy! I love adding applesauce to cookies, it really does make a difference! These cookies are stunning Gloria! I’ve never tried applesauce in a cookie, but this looks like the place to start! These cookies look so chocolatey and gooey…cake flour sounds like a great idea! Pinning, Gloria — I need to try these! I’m all over these cookies especially if they taste as good as they look. Pining! OMG, your cookies look delicious, I wish had that stack of cookies to eat right now! I printed your recipe, thank you. I’m all over your Chocolate Chip cake recipe right now…! Thanks, Michael! These cookies are so gorgeous! And how could they not be delicious!! AMAZING Gloria. I have actually never used cake flour. I will need to check that out! Nancy, I love using cake flour in a lot of things besides cakes. Just play with it. Maybe by putting some all purpose flour in a recipe and adding some cake flour with it makes a difference. A more tender texture. I use it in biscuits, pancakes, and other stuff. Go for it! Oh my goodness!! These cookies look spectacular. My favorite thing to bake is cookies as well and these are totally going on my “bake soon” list! Uh, like really soon. Sounds like a deal, my friend! Your snickerdoodle cupcakes are pretty amazing! Goodness, Gloira! Like I said, there would be tons of amazing food if we were neighbors. I’d have to get you to make a batch of these. These look so darn good! Pinning this and definitely going to have to try. I’m practically drooling over here! I’d definitely trade you for those Nutella PB cookies you made! Thank you so much, Stacy…. you just made my whole night! Elizabeth, guess I should have called them quad-zillion chocolate cookies… hehe. Gotta go big (on chocolate) or go home! OMG…I need these cookies Gloria!! I wanted to make a brownie type cookie last week, but they always turn out too crispy and heavy. I wanted gooey and chocolaty, and you have achieved that with these cookie! You are a genius!! 🙂 I must make these soon! Lisa, you would really dig these then. So funny how you were on the brownie kind of cookie about the same time …. great minds (or shall I say, blondes!) think alike! Hope you’re having a great cocktail tonight… have one for me! This is an amazing recipe Gloria!! Trifecta chocolate and applesauce for added moisture. Creative recipe development. Love it and can’t wait to enjoy it!!! Zainab, it was pretty fun creating this recipe! Thank you! These like amazing! What kind of chocolate did you melt for the batter and for pouring over the top? Milk chocolate? 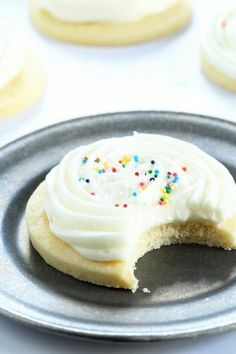 Soft cookies are the best! Thanks, Sarah! The applesauce makes these really tasty… thanks, Marti! Love these, Gloria! I can’t wait to bake these for my littlest- he’s a total chocoholic! Pinning! Gloria, I’m not sure if you got this or not my Internet crashed…so if you did just delete this one! But I wanted to let you know I featured these today in a chocolate roundup! You can see here! Gloria! These look so yummy! I have been using applesauce for years in cookies/breads for years. I always use unsweetened in place of oil when I can as I feel it is much more healthy and keeps baked goods so moist! Thanks for sharing. And I was thinking of how you could make these POP for more holidays! You could use White chocolate and color it to match: Red for Valentine’s, Green for St. Patrick’s, , Red, White and Blue for Memorial Day and July 4th, etc. You get the idea! And melt peanut butter chips, etc. and drizzle too! What ever mix you love! These are the perfect cookie! Thanks for sharing!